Goal: To correct and update the USMMA Horse Registration Database in 2016, including new photos. To encourage people not registering their Marchadors to join the USMMA and registry. If successful, to recommend that this project be repeated every 5 years. As a side benefit, people will also be asked to rejoin the USMMA as part of the survey process if they are not current members. Project Volunteers: Tresa Smith, Lynn Kelley, Megan Fallwell Thanks to them for their help and support. Emailed all members asking for updates on their horses. Followed up with phone calls if no response. Input new information into Wikihorse. New on-line form created for submitting registration information on a new foal. On the USMMA website. Completed form and photos emails directly to Registrar. Corrected EVERY MM record for horses in the US and Canada. Added the ABCCMM registration number and, if appropriate, the M Brand under markings. Changed many horse colors to grey. Changed some horses from stallions to geldings. Updated owner information and began transfer process for over 10 horses. Added 23 new foals born in 2015 and 2016 to the database. Will be registered as DNA is received. Did not update photos unless people submitted them. Many horses now adults still show foal photo. Did not contact non-USMMA members. Should be done this year or as part of the USMMA membership drive. Did not update transfer process - and it is clear that people do not understand it. 293 Marchadors in the USMMA database today. 265 Marchadors still alive in the USMMA database today. 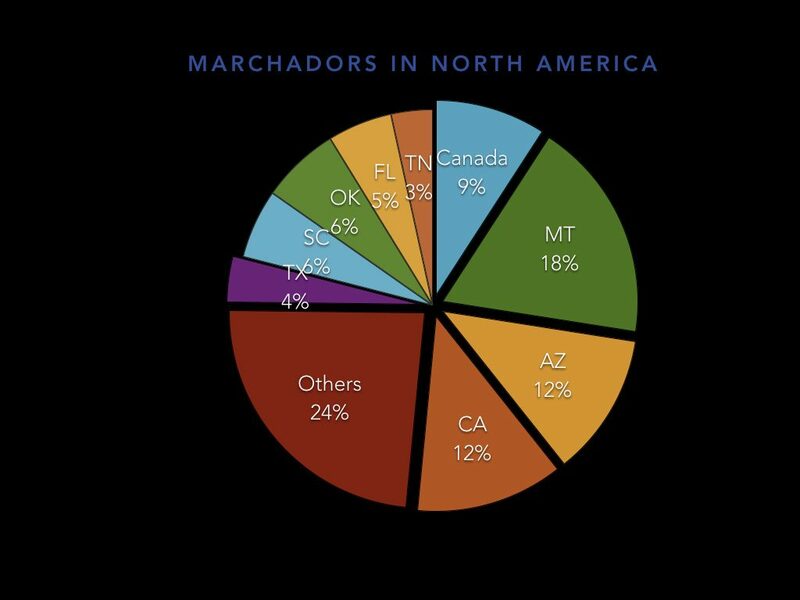 37 Marchador owner transfers identified. In the process of collecting $$ if they want the registration. Some are non-members. 63 Marchadors were born in Brazil. 6 Marchadors born in Canada. 24 Marchador horses there in 3 provinces. Breakdown of horses is below. 4 US states - AZ, CA, MT comprise more than 40% of the MMs in North America. Canada breakdown is BC - 5% , AB, - 3% SK - 1%.